This week we received Highlanders latest offerings from there Pro Force range of MTP compatible packs. Today we will have a look over these new packs and try to help you decide which the right one for you is. 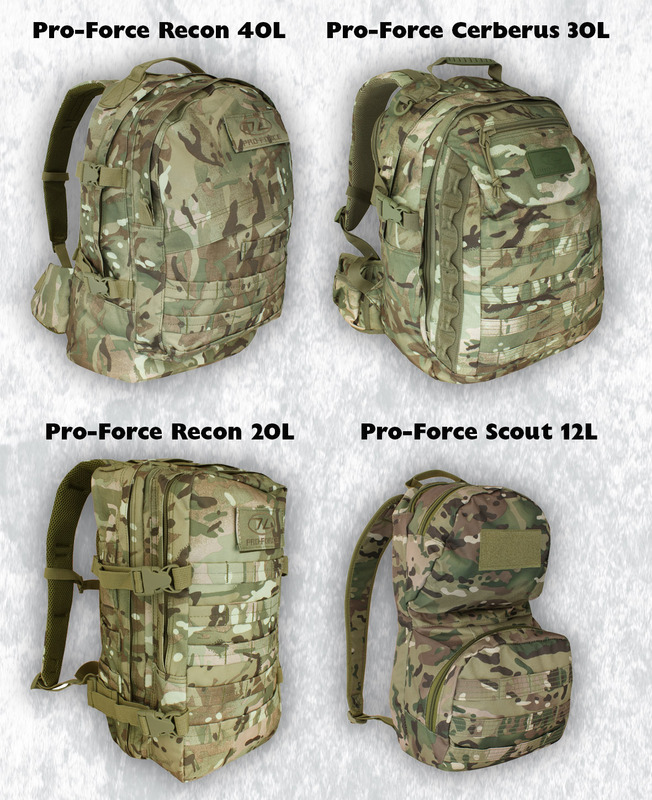 We will be looking at four new rucksacks all from Highlander’s Pro Force range which are the 12 litre Scout pack, the 20 litre Recon pack, the 30 litre Cerberus pack and the 40 Litre Recon pack. All these packs offer compatibility with MTP uniform and equipment and they all offer good value for money. Here we will talk a little bit about each one debating the positive and negative points and give our opinion on the best one for you. First up is the 12 litre Scout pack. This rucksack is the cheapest of the 4 coming in at only £14.95. It is also the smallest with a 12 Litre capacity. It does however include a number of features which you maybe wouldn’t expect from such a low cost pack. The Scout is constructed from XTP600 nylon with PU coating making it lightweight and showerproof. Also included is an AirMesh back system to aid cooling and increase comfort. On the main front compartment there is a MOLLE webbing array allowing you to attach extra pouches and accessories. On a pack this small this is a great addition as you’ll probably find yourself wanting more room so this will allow you to do that. However the size of this pack really does limit its uses. The scout isn’t really big enough to class as a day sack and therefore you wouldn’t want to be taking it out into the field as you’d probably have to carry most of your kit. If you did take it out into the field it’s probably worth getting yourself a small waterproof rucksack cover or dry bagging all your kit as after prolonged rain exposure it probably won’t hold up to well. These are available to purchase separately here at cadet direct. The Scout then does offer very good value for money however its size is a big limiting factor consigning it really to classroom courses where all you need is a notepad and your lunch. Next up we have the 20 litre Recon pack. The 8 litre increase in size over the scout does make a very big difference and starts to bring it into daysack territory. The pack itself Shares a lot of features with the scout which include MOLLE webbing array, a more advanced AirMesh back system and velcro ID plate. The Recon goes further though with padded shoulder straps, chest strap and quick release hip belt and compression straps on the side to pack more kit in. This makes the Recon much more wearable than the scout and the extra room and hydration bladder compatibility means it could be used as a daysack. Overall the Recon offers a lot more than the Scout in terms of size and features at a great price of only £26.95 however it is still on the small side for a daysack and therefore you may want to look at the Cerberus and Recon 40. But if you’re new to cadets and need something to get you started you can’t go too far wrong with the 20 Litre Recon pack. The Cerberus 30 Litre pack is the most expensive pack of the 4 coming it at just over £60. For this money you expect quality and this is what you get with the Cerberus. Firstly its 30 Litre size makes it an ideal daysack and you’ll have no problem getting all the kit you need in. The Cerberus is without a doubt the most comfortable of the 4 to wear and is ideal when walking over long distances. It also features a tonne of extra compartments and features which we really like here that set it apart from the other 4 which include hydration sleeve, a fleece lined pocket for optic and eyewear protection, mesh compartments, a padded laptop compartment, a built in dry bag which can be removed quickly and easily to access the contents and a waterproof bergan cover with a zipped stowaway compartment. The Cerberus is easily our favourite pack due to its extensive features, versatility and durability. Finally we have the Pro Force Recon 40 litre pack. As you might have expected the Recon 40 is fairly similar to its little brother the Recon 20 and offers a lot of the same features. The 40 does however include a couple of extras that we really like. Firstly is the padded hip belt. This makes such a big difference to the comfortability and make it’s a lot more wearable than the Recon 20. It also features a much more substantial and stronger webbing carry handle which is probably the best of all 4 packs and our favourite little feature; paracord zips. Now they’re not something you particularly need but they’re a nice little touch and could be very helpful in an emergency situation giving you a few lengths of paracord. At only £34.95 the recon 40 probably offers the biggest bang for your buck of all these packs and is without a doubt very good value for money. So after looking at all 4 of these packs our favourite by a long way is the Cerberus 30 Litre pack. It’s ideal size and vast array of features makes it really stand out above the rest. For the pack with the best value we would go for either the Recon 20 or 40. Both these packs are really great value and offer durability and a lot of practical features. The only way you can choose between these two is how much kit you need to carry. Finally we have the Scout which isn’t a bad little pack for the price however its size and lack of features mean it’s our last choice. Next	Win yourself a FREE Pro-Force Multi-Terrain Basha from Highlander! Previous	Blade Fast Boil Mk 2 Now in Stock with MTP Sleeve!